Lucy Bailey’s production of Shakespeare’s fairytale for grown-ups hits the spot, thanks to a no-nonsense approach and a straight-faced telling of what is essentially a far-fetched and melodramatic narrative. She allows the humanity of Shakespeare’s characters to flourish despite the exotic nature of their circumstances. William Dudley’s design concept impresses from the start. A video screen fills the back wall, showing an ever-changing seascape, a kind of mood ring that reflects and supports the emotional changes in the story. The court of King Leontes is a bohemian affair (well, it is Bohemia!). Patterned carpets and cushions are strewn across the scene and on these, the king and his courtiers lounge around in this calm before the storm. With the hookahs and the turbans, it’s all very Byronesque. Leontes quickly proves he is mad, bad and dangerous to know. As Leontes, the king driven to distraction by misplaced jealousy, Jo Stone-Fewings is entirely credible. His rapid descent into delusion unfolds before our very eyes, triggering a disastrous series of events. He is convinced his wife Hermione (Tara Fitzgerald) is having-it-off with his lifelong bezzie mate, Polixenes ( Adam Levy) and that the child she is carrying is not his own. The scene in which he publicly accuses and denounces the queen is shocking in its violence. A swift punch to her belly reverberates around the auditorium. – only minutes before we may have been tutting at the drag she takes from Polixenes’s cigarette! In this pre-Jeremy Kyle setting, the only way Leontes can discover the truth is to despatch a couple of men to consult the Oracle. They return with the mythic equivalent of DNA results: the queen is innocent, Leontes is a jealous twerp, et cetera. They also bring the dire warning: Leontes shall have no heir until that which is lost is found… Here Shakespeare puts the audience in god-like omniscience: we know the baby, abandoned in the wilderness, has been found… There is something comforting in this knowledge, and curiously, it doesn’t rob the play of its tensions. 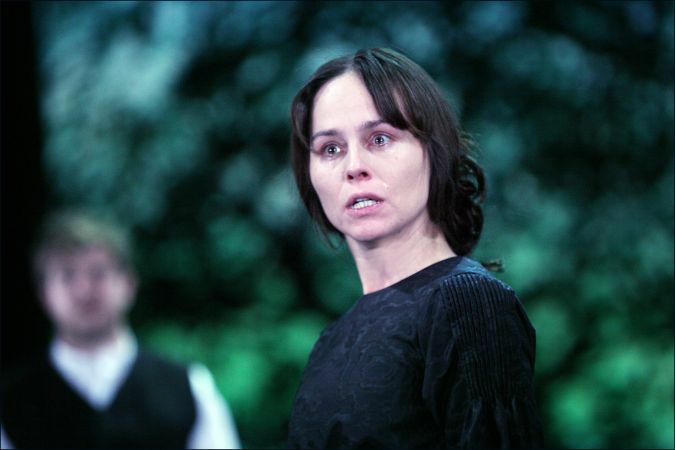 Tara Fitzgerald as the much-wronged Hermione is very strong. Her delivery is as though she is thinking up the lines on the spot, her mind racing to make sense of the hell she is shoved into, as befits the stress placed on a woman arguing for her life. With every production of this play, the question always crops up: how will they do the bear? The famous bear of the famous stage direction. How will it appear and how will it pursue Antigonus to his exit? This time, the bear is a bit of CGI animation, arising from the waves on the backdrop like an ursine Poseidon. Antigonus has to move towards it before he can get off-stage. A bit disappointing: the bear reminded me of those behind-the-scenes at Toy Story clips, where a character is modelled on screen, before all the surface detail is added. It seems unfinished. But this is only a brief moment in a production that is for the most part commendable. The second half takes place sixteen years later. Bailey rightly drops the outmoded prologue by Time itself – we have moved to a more modern age. The romantic, rocky coastline of Bohemia is replaced by a more proletarian pier. We are in a place of deckchairs and knotted handkerchiefs. This is an earthy contrast to the court of Leontes. The locals indulge in a spot of country dancing, clog dancing, morris dancing, and the rough and ready females have at each other like a riot in Prisoner Cell Block H. By contrast, lost princess Perdita (Emma Noakes, bearing a passable resemblance to the unfortunate Hermione) stands out as someone regal – even if her accent is all ee-by-gum and ‘eckythump. This is wakes week in a Northern industrial town. Perdita and her beau (the son of Polixenes, passing himself off as a morris dancer) cannot escape the notice of Polixenes himself, also travelling incognito. He upbraids and beats up his errant son in a display of offspring abuse that is a running theme in this production. We have already seen a child abused in utero and subsequently abandoned to its fate. It seems the grown-ups in the two kingdoms are unreasonably visiting their anger at themselves on their children. 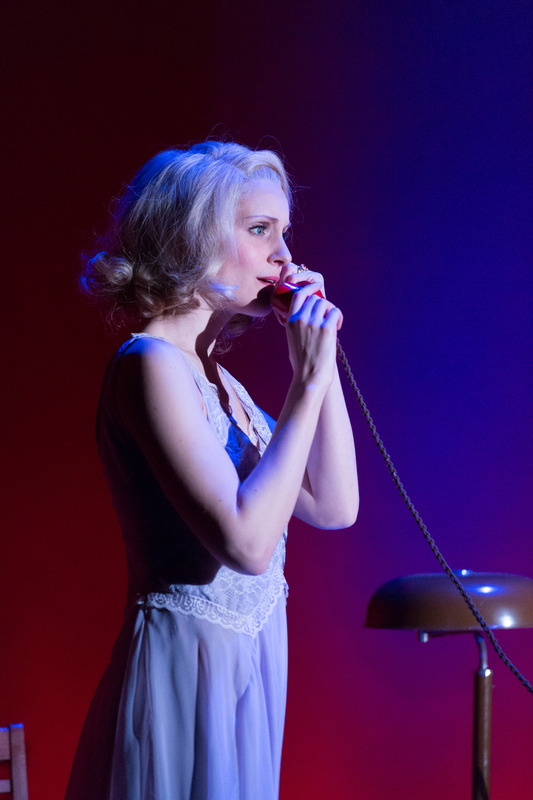 Emma Noakes is charming as the lost-and-found princess. As Florizel, her dashing boyf, Gavin Fowler has something of a young Josh Groban about him. I also enjoyed Pearce Quigley’s rather deadpan Autolycus and Daniel Betts’s reliable Camillo. Rakie Ayola is splendid as the forthright Paulina, speaking her mind and putting the king in his place. Her mild-mannered husband (Duncan Wisbey as bear-fodder Antigonus) is just as effective in contrast. As the good-natured shepherds, David Shaw-Parker and Nick Holder bring the warmth and humour that is absent from the court of Leontes. The king himself is ever-present, atop a rusted tower that is part lighthouse and part helter-skelter, a beacon of his own repentance, a public demonstration of his self-inflicted sorrow. The resolution is always keenly anticipated. How will they perform the statue that comes to life? (I told you, it’s a bit far-fetched). Tara Fitzgerald blinks and stirs as though returning to living form, supporting Paulina’s fiction until the last possible moment and the revelation that the queen has been hiding away for all these years. It’s always a credibility-stretcher but the scene is so embued with moments of reunion and reconciliation, it works. In this instance it’s more touching than out-and-out moving, but you leave the auditorium with a warm glow, ready to face the cold air of winter on your cheeks.